Old Harbor is certainly worthy of its nickname – Little Scandinavia. 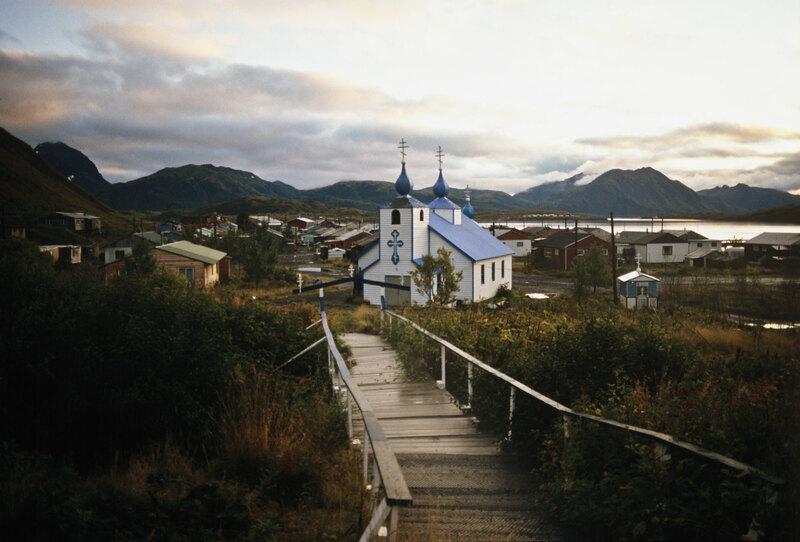 Most of the village’s 220 inhabitants are descendants of young Swedish and Norwegian men who arrived on Kodiak in the early 1900s. The village is nestled between a narrow beach and the steep slopes of the grassy mountains. Nearby islands protect the harbor from the Pacific storms. Rolf Christiansen, was born in 1890 in Kristiania (now Oslo) during the time when Sweden and Norway were a union. Arthur Haakanson, was born in 1886 and came from southern Sweden via Langeland in Denmark. Both of them ended up, through remarkable circumstance and after many years at sea, in Old Harbor on Kodiak. As a boy, Arthur Haakanson dreamed of going to sea, but his father thought that, at 14, he was too young, so he arranged for him to work at the docks instead. It wasn’t long, however, before he was offered a job on a ship heading for Greenland. Returning home a year later, Arthur found that a life at sea suited him better, and he soon signed on to a new ship. In New York, he met a young Norwegian sailor, Rolf Christiansen. They became good friends but soon went their separate ways. Many years later, their paths crossed again when they ran into each other in a bar in San Francisco. The conversation drifted to Alaska and the possibility of making good money. The two friends separated again, but the thought of Alaska lingered in their minds. Arthur got a job on the herring boat Hunter, en route to Alaska. On August 30, 1917, with its hold full of cod, the ship hit a rock outside of Chignik on the Alaska Peninsula. The ship sank in just four minutes, but everyone on board escaped in the lifeboats. The rock that sank the ship is still known as Hunter’s Rock. In Chignik, the last ship going south had already sailed, so the crew boarded a ship headed for Kodiak where they had to spend the winter. At the time, the population was only 300, and the town had very little to offer the shipwrecked survivors. In the spring, a passenger ship arrived with cannery workers, and most of the crew from the Hunter booked passage south. Thirteen decided to stay – Arthur was one of them. He spent the next ten years working at different jobs around the island, until he was offered a position as foreman at a cannery in Three Saints Bay. One day, he heard that a Norwegian whaling ship was docked at Port Hobron, near Old Harbor. A dance was held every weekend in Old Harbor, and the Norwegian crew was expected to attend. Arthur and several friends hopped in a boat and rowed to Old Harbor, a four-hour trip, to attend the dance and to meet the men from Scandinavia. As Arthur’s boat pulled into Old Harbor, he was surprised to see his old friend, Rolf Christensen, arriving in another boat. “What have you been doing for the last 15 years?” he shouted in greeting. The two friends had a lot of catching up to do. At the dance in Old Harbor, Rolf and Arthur met young girls from the village. The following spring, a big double wedding was arranged for the two friends and their brides. Both families were blessed with many children, and in time, Rolf’s daughter, Mary, married Arthur’s son, Sven. The most common name in Old Harbor today is Christensen. These are descendants of Arthur Haakanson’s best friend, Rolf Christensen, who arrived in Old Harbor in 1931. I met with Rolf’s son, Carl Christensen, at his beautiful fishing resort on the edge of the village. Shortly after arriving, Rolf was offered a job as a cook at the Port Hobron Whale Station on Sitkalidak Island, just across the bay from Old Harbor. After meeting Sasha Kelly, a young Sugpiaq woman, he would row across the bay to Old Harbor every weekend to court her. When they married, Rolf was 41 and Sasha was 17. Sasha loved Rolf’s blue eyes and often said that she would like to pluck them out and eat them. Considering that seal eyes are a delicacy among the natives of Kodiak, it may not have been just an idle threat. Happily, Rolf held on to his eyes throughout his life.